Will you BE MINE? I’ve been published! I submitted this image to a contest last month. It was for inclusion in the “Eye on Fine Art Photography” magazine. I was very happy to be chosen for the inside full page back cover of this contest. The theme for the month of February was of course, Love. So here it is. This image is a compilation of many photos I have taken with the theme of hearts. It’s amazing to realize that when your eyes are open you can see hearts everywhere. To view this image in the magazine that published it. This magazine is available here . Have a happy HEART-Filled weekend! What kind of lens do you see life through? If you were to take a group of people, let’s say five to keep this simple. You take this group out into a large park or piece of land and hand each of them a camera. You say, “Go out and shoot pictures of whatever interests you for an hour”. What do you think you will see when they get back? Each person would bring back pictures or images they found interesting to them. Each person would bring back their own perspective of beauty, life, nature, animals, inanimate objects and all sorts of different images unique to their own tastes and idea of what is interesting or beautiful. It was the same place, the same area, same piece of land but each person’s images would differ greatly. It is lot to do with how people see life, what their past experiences are and how they see life in general. Some may show beautiful landscapes depicting the wondrous glory of nature. Some may show animals or birds showing goofy behavior. Some may focus on shadows or reflections. It will all be different based on their unique views on life. So my question for you is, What kind of lens do you see life through? Is it one that is happy and cheerful? Is it one that is serious or dark and brooding? Maybe it is one that is curious or humorous? We all have our views on life and some are positive and some are not. But this is more than just looking at the glass half-empty or full. It’s about images that make us see things differently than we did before. We are such a visual society, with quick access to a camera on our phone, any time of the day we can record life. We have this innate need to share our vision with others, hence social media sites like Facebook, Google+ and all the others. Anytime I take a picture, it means something special to me. When I share it with you, I hope you can see what I see. So tell me, what kind of lens do you see life through? Do you see things in mostly black and white? Do you see things full of color? Does your vision lend itself to strength and sustenance? Or do you view life with a slice of goofy humor? Whatever way you see life will draw in others who see life the way you do. And that’s a good thing. Texture in Art and Photography is a favorite theme for me. To me it shows depth and it almost seems to be begging you to reach out and touch, reach out and feel. (Okay, Don’t do this at a museum. I don’t think they would like for you to touch their paintings from the Masters). Anyway, there are some images I like to create that are full of texture. It may be an abstract of some sort with no real theme, but it does have something special about it. The texture is rich. These are two photographs I took when I was out and about looking for interesting subjects to photograph and I came across this old building. The colors of the brown and blue attracted me and I ended up with this. Onto another place, I was a little disappointed I could not find any cute flowers to shoot. This one part of town had a lot of construction going on and I saw this pile of concrete pieces and I thought, “Hey, this could make for an interesting piece of art. This is what I got out of that. In art, oil paintings that seem the most beautiful to me are those with a lot of texture, where the paint is piled on thickly but with that comes a beautiful image rich in texture. I mostly work with acrylics and I am still working on achieving that thick textured look but here are a couple of pieces that I think go nicely with this blog. I hope you enjoy. (All images here are available for purchase, just click on the images and it will take you to my site. What are your thoughts about texture in art? How did it all start? With eyes wide open. Art through the ages as I have learned in my Art History Classes clearly show man’s need to express oneself, to communicate even at a time when language did not even exist. From carved out pieces of rock to paintings on the cave walls. Human nature has a distinct need to share something with others or so it seems to me. When was the last time you logged onto your facebook? It could be what they see or how they feel or what they believe. It is amazing to me that even back then as early as 25,000 years ago we were created with a desire, a drive or a passion to express something about us or something around us. For some it is not as apparent as with others. The Artist is not limited to only certain people. I don’t believe that. We are all wired differently than others, we are all gifted with special gifts and talents unique to ourselves but I do believe we all have an artist in us even if it is to appreciate the art of someone else. When did it start for me? However in high school I was so fortunate to take a photography class and it really swept me away. I saw that I could tell a story with one picture sometimes even better than any words I would lay down on paper. Photography is the one thing that has stayed with me throughout my life even to this day. Writing came and went as life distracted me with work, kids and the likes. I always had my camera ready to capture a moment whether it was happy, joyous or trying. I captured it all. I never even considered myself a PHOTOGRAPHER, an amateur at best. It was not until a few years ago when I was looking through my old photographs I realized, “Hey this is a good shot”. I wanted to do something with it professionally and this move has taken me to an entirely new level with art. I now work at a job doing what I LOVE to do, I take pictures and I also have the liberty and flexibility to explore other areas of art such as drawing, painting and now back to writing again. This makes me me smile. 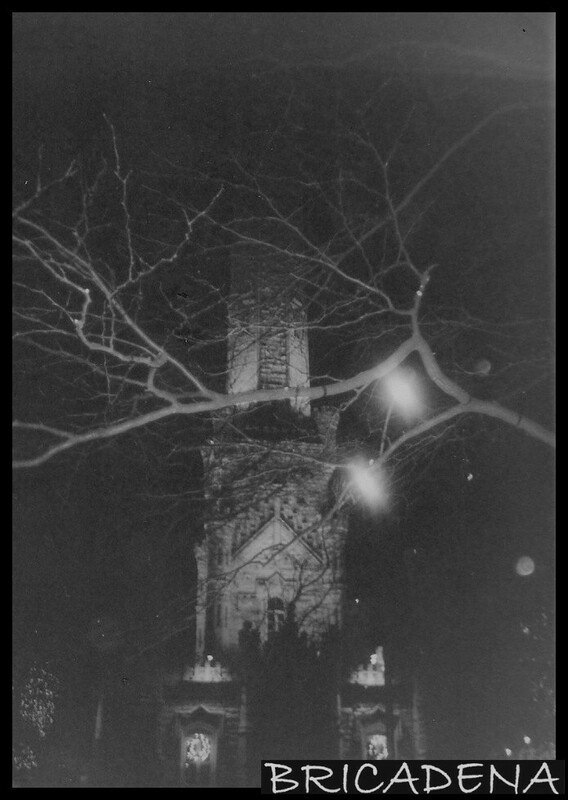 Here is an early piece of my first pieces of photography, where it all started for me. These were taken around the early nineties and even though I am surely dating myself. I still have that desire in me to see something and want to capture what I see through the lens. It’s been enlightening and hopefully by sharing it with you, I can enlighten you as well. Art prints are available by clicking on image links like this one above. “The point of all art is creation. It is a creation of the artist. If the creation can express something to those that look at it, then it becomes good art to those who are looking at it. That is the perception of the people who consider it good. That is what I want to do. If you can see my art and perceive what I do, relate to it or become moved by it, then I will have done my job as an artist. I have been doing photography for many years. It was one of my favorite classes in high school. I still remember when I got my very own first 35 mm camera. It was my most prized possession, (before I had my kids). I took pictures of everything. The possibilities were limitless. I didn’t realize over the years that the lens would lend itself to train my eyes to see the world differently, to see life differently. Everyone loves the saying, “Slow down to smell the roses” but how often do we really do that? How often do we stop and look, stop and reflect at just how wondrous our world is. It’s easy to take for granted the beautiful blue sky when you are running late for work and your stuck in a traffic jam and road rage is all around. Why don’t you look up next time you go outside and just look at the beautiful formations in the clouds. You never know what you might see if you lift your eyes to the sky. This was taken back in 2008 and I was at the park with my daughter. Luckily I had my camera and the moment I saw this, I grabbed up my camera and took this shot. This is exactly what I saw. Minimal post processing done on this image, just a bit enhancement of the colorful sky other than that no photo manipulation at all. What are the chances I will see love in the air this way again? After many years, I finally decided to take my love of photography to a different level. I decided I wanted to do this professionally and artistically. I just wanted to share with others what I see. When I made that decision and started stepping out with my camera again, it was like these blinders were lifted from my eyes. It was like this fog that obsurred my vision vanished and everything my eyes fixated on became art to me. I had taken pictures of everything I could find interesting in the city. And when I couldn’t find something outside, I created images in my head and arranged my subject matter to fill the frame and clicked. This image of this leaf is the size of my thumb. It’s tiny. And I would have missed this beautiful testament of love in this leaf by this heart shaped design that could only have been created by God himself, had my eyes been closed to it. At some art shows I have been asked, where I travel to, for the photos I have showcased. I simply reply that I don’t travel, it’s all taken here, with the exception of some favorites in Chicago. I started trying to figure out what else I could take pictures of, (of course there are still so many things I could use for a subject). I decided to look closer, dig deeper and realized a valuable truth. It is true to me at least. As I am venturing into other forms of art, using different mediums to express myself I realize that all life really is art to me. It all depends on how you look at it. What do you see when you look at a piece of my art? What do you see when you look at art from any artists? I can tell you there are two things among others and that is their(artists) heart and soul that you will see. And this is to me is the greatest gift I can give to you, the viewer is a vehicle or way to look at the world and life in a different way than you did before you came across one of my art pieces. Here is wishing you a wonderful holiday and Marry Christmas. I hope you liked the gift I gave you today. I can’t even remember how I came to this realization. It’s been a constant in my life for so long. I would call myself an artist but that seems trite. I love art, always have and probably always will. It did not matter what type of art, I am easily moved by a painting, a drawing, some words on paper even a part of a movie or lyrics to a song. I am drawn to it like some magnetic force that pulls me in and overcome me. I gauge how wonderful I think a piece of art is by my own emotional response to it. I take pictures of babies and certain photos I do, if it give me chills or goosebumps at least to me I know I did right by my interpretation of that subject. I was able to capture an emotion, I could see all sorts of things through just one picture. I know I did it right because when a parent sees the image and has tears falling down their cheek, I know I did it right. I used to write poetry in a blog and I would on any given day open up my poetry writing to my audience. I played a game with them called, “Off the Cuff” Poetry Challenge. I would have people post a comment about something, anything really that they wanted me to write a poem about. All they had to do was offer a word, a phrase, or even just a photo. I would take whatever was offered to me and write a poem and post it immediately as my response. I was writing poetry off the cuff. People were amazed at what I could do. I had so many people tell me that I hit the nail right on in how I worded this piece of prose based on their suggestions. I had a voice and had found my audience. Lots of times I would write about life experiences that universally are common, maybe not to each and every person but a lot of them. I remember writing a poem for someone about miscarriage. I had never had one myself but I tackled that subject and dug deep inside, imagining what I might feel if that had happened to me. Then I started writing. She thanked me for writing this piece called “Nest without an egg” and told me that I captured what she was feeling. As someone who has truly enjoyed photography since I was a teenager, I love to capture images or as many photographers call it, “A moment frozen in time” As I started to take my photography more seriously many years ago I found myself searching for that picture, that story within my subject. For the most part when I take a picture of a flower, it usually is not just a flower I am shooting, I happen to see a story inside that little black box inside my viewfinder. My definition of Fine Art Photography is seeing more than the subject in front of the camera, it is seeing a story within that frame. 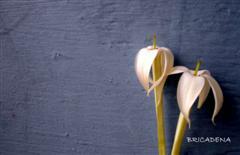 This is more than just a picture of a couple of flowers with a nice slate blue background. I see these two flowers in a relationship with one another. One seems to be reaching out to the other. However the other flower seems oblivious to the efforts of the flower on the right. I call this Unrequited Love. Isn’t that a universal concept or idea in human relationships? Haven’t we all had feelings for someone who did not share those same feelings for us? I like to see things other people may not notice offhand and that what comes across in much of the art I create. The size of the flowers are quite small. I don’t even know what kind of flower it is. 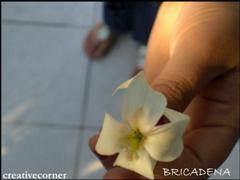 This is one of the flowers nestled into my daughter’s hand. I took this picture in 2007, so that makes my daughter’s little hand the size of a 7 year old at the time of this photo. It does not always happen this way, where I shoot an image and some idea or concept or even a story comes to mind but it does happen often enough that I realize what my eyes see inside that viewfinder is my voice of the subject matter I am using to say something. It is what I have to say. Now I draw and paint and again, I see myself drawn to express something emotional, a life experience. I suppose this means that I have something to say. The quest for me is to find the audience who want to receive my message. If what you have to say is from your deepest feelings, you’ll find an audience that responds. Art and the appreciation of art is very subjective. I fully realize that not everyone will get my art. Not everyone will even like my art. As much as I love art, I do have my favorites and then there are some that eh, not so much. The art I most enjoy creating is about life. Every facet of life, the joyous and the painful, the happy and the sad and everything in between. Here is a poem I wrote way back when that seems to match what I have to say about life. It’s more of a question to ponder. In life there is a death. After hello’s there are goodbyes. What happens in between? How will your story end? What will they say about the life that you have lived? What will they remember, those who you loved? When your name dances off their tongue? Will the memories be of joy or of sadness? Will they think of hope or complete madness? What legacy will you leave your family and friends? Every minute counts and all the times you spend, loving instead of hating, living and learning, laughing instead of crying, giving instead of taking. All that is in between that first hello and last goodbye is what will matter the most in the end. So how is it gonna be for you? Tell me this. I think my story involves what I want to say to the world and the audience who wants to receive this message. So, that is my quest, what I am searching for, the audience who wants to receive my message. It can be through a painting, a drawing or the images I capture with my camera or even the words I write. Help put my art in front of others by sharing this blog or my website on your Facebook, Twitter or other social media you are engaged in. 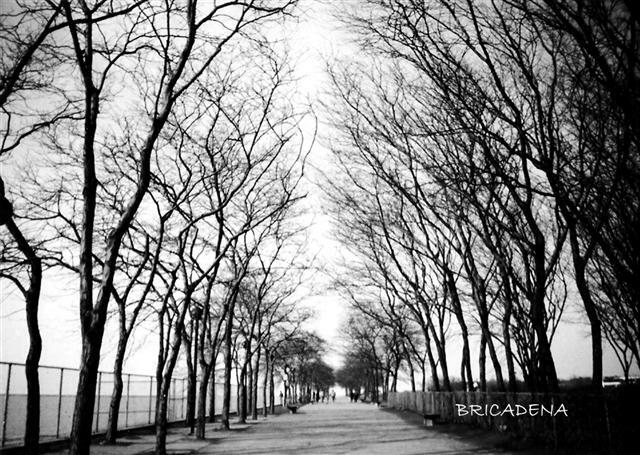 All creative work within this blog is the original work of Brigitte Cadena – Bricadena. Copyrighted to Brigitte Cadena – Bricadena and, as such, is protected by US and International Copyright laws. I still remember as a young girl writing poetry when I was still in eighth grade. It was a way for my to express myself. I don’t remember as much taking art classes, except I do remember making a little vase and then using the inside of a cardboard with it’s ridges and making a patterned print that looked like a checkerboard. In high school, because I loved to write I took a couple of journalism classes. It was fun, challenging and exciting to be involved in the school newspaper. My photography class was amazing and so much fun. I loved having a way to express my thoughts and ideas in a way other than speaking out. When I was nineteen, I moved to Chicago and lived there for several years. What I loved about being in this great city was the culture it offered from the music festivals to the Art museum and the bustle of a big city. That is what I miss the most about living there. I remember living in an up and coming neighborhood that occupied a lot of artists in the south side. It was an August afternoon and I went to the neigborhood’s “Artist’s Open House”. It was a yearly event where the artist’s who lived in the community would open up their doors and let you walk freely into their homes (their studios) and check out their work. These were older buildings that were rich in detail and artistic flair. It has been said that the artists move into a (lower income neighborhood), they jazz up their place with their creativity and then the property values would rise and everyone would follow. I was selling real estate for a short while later and that area was a hot place, everyone wanted a piece of it. Now, it is a thriving and wonderful place to live and hang out. I was talking with Alan Albin, a contact for the artwalk when I went to deliver my art piece for the September art prize draw. I told him him that Artwalk reminds me of my time in Chicago when I could breathe in all the culture and diversity of the city. I even said, “Why I didn’t take up drawing back then when I lived there is beyond me”. Like I mentioned, I loved to write and I loved to take photographs. I never considered myself an artist. I only started to draw in 2008 and realized that I wasn’t all that bad. Back to Artwalk, when I see people walking around downtown Corpus Christi and I see new venues open up, I see life being breathed into our city. Artwalk is an activity that you can participate with your friends and your family and it offers you a second set of eyes. What I mean is as you go to the different venues where artists are sharing their work with you, you are given an opportunity to see life differently through someone else’s eyes. Look at the wide variety of art displayed by our local artists and you will take something back with you when you leave. Art is important because it was one of the first forms of communication we had from 25,000 years ago. It was the carvings in the caves that gave future generations a glimpse of what was going on before them. After a long day at work what are some things that relax you or help you unwind? Music? or a movie? Where did that come from if not for the creativity of artists? I support the Artwalk because to me it is something fun you can do with your friends, your family and your kids. So come downtown this Friday, September 30th around 5:30 and enjoy all that the Artwalk has to offer. Sure it’s a play on words but I just couldn’t resist. This is a website that is FOR the Artist. I stumbled onto this site this summer and had it in my mind I would give it a try. This site is for the artists to showcase their paintings and get feedback on their work. I was seriously wanting to get some feedback on some of my latest work in painting and this is the best place I have found so far. Michelangelo was adament in his time that he considered himself first a sculptor before he was a painter. According to Art History he never wanted the commission of the Sistine Chapel but the Pope insisted that he do this job or risk future jobs he was negotiating. You see, I love all art. I really do and when I set out to try a new medium or technique-I just dive right in-no life saver vest or anything. However, I have been doing photography for so many years, it comes so naturally for me, I don’t even think twice when I have my camera in my hand, I click away. Paintings I love – Brigitte Cadena that offers me just what I needed. If you are an artist and you want to get some good constructive feedback for your work or new pieces, this is the place to join. The people are friendly and encouraging and you will be among some wonderful talented artists from all over the world.